One of my favorite metaphors is the guy who stumbles out of the bar late at night and can’t find his car keys. Although the keys are probably somewhere back in the bar, he doesn’t look back there, nor does he look around his car: too dark in both those places. Instead, he looks under the street light. Now, it’s probably a good thing this guy never finds his keys; he shouldn’t be driving. But the main point is that he’s looking where it’s easy to look, not where he should be looking. I think about this every time I hear that American employers are fed up with millennials and their poor “soft skills,” like teamwork, communication, organization, creativity, adaptability and punctuality. According to a LinkedIn study of hiring managers released last fall, 59 percent said soft skills were difficult to find and this skill gap was limiting their productivity. This isn’t simply an American problem. 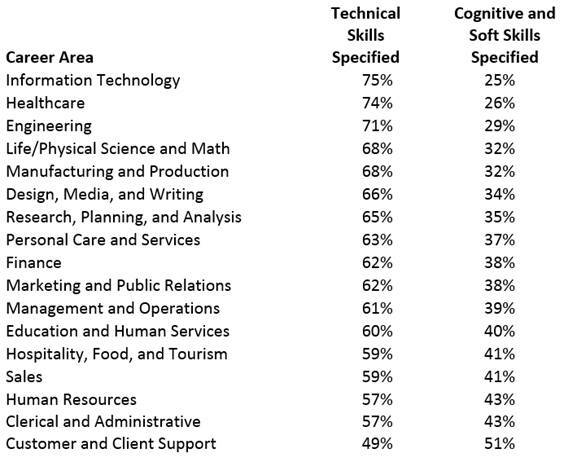 In the U.K., a survey of 198 employers by the Confederation of British Industry found that soft skills were more important to employers than technical knowledge. In Canada, a report by the Canada West Foundation found that new graduates are technically strong, but lacking in soft skills like communication, decision making and the ability to work in teams. But what if employers are looking for soft skills and not seeing them? They’re the equivalent of the guy who stumbles out of the bar and looks for his lost keys under the street light. The vast majority of mid-size and large employers in the U.S., U.K. and Canada utilize applicant tracking systems. Applicant tracking systems (ATS) make it possible for employers to post new positions online and manage the hundreds of applicants who typically respond to each opportunity. No human hiring manager reviews hundreds of applications. Instead, the ATS produces a manageable number of viable candidates for the hiring manager to review. How does the ATS do this? It’s not magic, but rather a keyword-based filter, comparing resumes to the posted job description and passing through candidates who appear to be a better match. Faced with the need to differentiate hundreds of candidates for every online posting, employers have added many new job requirements — most of which are technical. According to Burning Glass, technical skills now dominate in terms of the sheer number of competencies demanded in job descriptions — more than cognitive and soft skills combined for virtually every career. While the dominance of technical skills in job descriptions is probably a reflection of the fact that it’s easier to come up with 10 technical requirements for a job than 10 different ways of saying “problem solving” or “communication skills,” this is the reality millennials face in being seen by hiring managers. Because if they don’t have these technical skills, they’re not making it through the ATS filter. And if they’re not making it through the ATS filter, they’re effectively invisible to employers. Conversely, which millennials are visible to hiring managers? The ones with technical skills. And guess what: For many of these technically prepared millennials, soft skills aren’t their strong suit. Does this mean there’s a soft skills shortage or that millennials are all late, disorganized poor communicators? Quite the contrary. The punctual, organized and well-spoken millennials whom employers should want have played by the rules and completed college degrees. But because nearly all colleges and universities continue to live in a bubble, floating high above the mundane concerns of the labor market, and because they continue to believe that the job of higher education is to prepare students for their fifth job, not their first job, colleges have not seriously undertaken to provide “last mile” technical training to students. So all these millennials are missing are a few key technical skills. There are two solutions to this supposed soft-skills shortage, neither of which involve soft skills (which are harder to assess and train). The first is giving all millennials a chance to become visible to employers through last-mile technical training. I’m not counting on universities to do this. Nor do I believe employers are likely to lift a finger. But I’m seeing the rapid emergence of intermediaries bridging the skills gap in a range of areas — data science, coding, sales, healthcare — by providing a combination of last-mile technical training and placement services to students. So when I hear employers complain about soft skills, I assume they’ve been drinking. Because when they’re looking for great soft skills in the limited set of technically oriented candidates making it through their ATS screens, they’re effectively looking for their car keys under the street light.